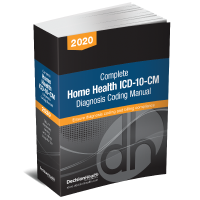 Coding guidance you can trust from the publishers of the Complete ICD-10-CM Diagnosis Coding Manual for Home Health, the gold standard in diagnosis coding. 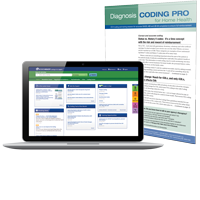 Diagnosis Coding Pro for Home Health provides you and your coding staff with ICD-10-CM coding and training education. It’s like having a coding consultant show up in your agency every month. The monthly newsletter delivers the guidance you and your coding team need to select the code and code sequence that accurately reflect a patient’s condition to justify services provided, prevent claims delays, support OASIS-C assessments and ensure full payment. Every issue delivers coding scenarios, and exclusive home care diagnoses benchmarks, practical decision trees and expert advice as to how to prevent common errors. Best of all, every code and each example is checked by the top home care coding experts in the field. Diagnosis Coding Pro is published by the same staff that brings you Home Health Line and OASIS-C & Outcomes Solutions. ICD-10 Training – Every issue contains detailed information on ICD-10 coding, including scenarios of your most common home health diagnoses. Be among the first to learn about code changes – and how they affect your agency’s reimbursement. Plus with your subscription to Diagnosis Coding Pro for Home Health, you’ll get online access to a searchable database of articles, and the full issue archive. It’s never been easier to reference valuable articles for coding tips and training. Every issue of Diagnosis Coding Pro for Home Health is packed with innovative solutions that HHAs are using to improve coding success and train their staff. Subscribe today and give your clinical staff the information they need to ensure accurate coding and full payments. 100% Money-Back Guarantee: If you don’t agree that Diagnosis Coding Pro for Home Health trains you and your coding staff in ICD-10-CM coding, plus provides the news, tools, tips and guidance to help you advance your career and increase your value as a professional coder, we will refund your entire year’s subscription – no questions asked!